The Mountain of Fire and Miracles Ministries (MFM) is a Pentecostal organization founded in Yaba, Lagos, Lagos State, Nigeria in 1989, now with churches in several English-speaking and non-English speaking countries. It was founded by Dr. Daniel Kolawole Olukoya (DKO). 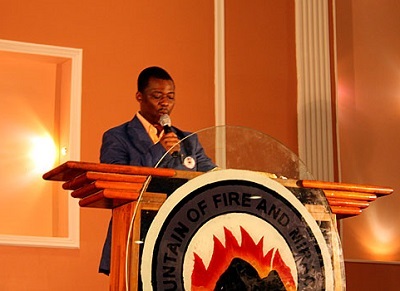 Mountain Of Fire And Miracles Ministries was founded by Daniel Kolawole Olukoya at a prayer meeting in 1989 in his living room. The prayer group purchased a large site at an abandoned slum near the University of Lagos and converted it into the International Headquarters of the Mountain of Fire and Miracles Ministries of which Olukoya is the General Overseer. The first service there was on April 24, 1994. Due to the increase in new converts in a short period, the church was moved to its present location in Ijeshatedo on a sixty plot of land which can contain over 30,000 members in a service.